In the corner of Compton Bishop churchyard lay a heap of branches which had recently been trimmed from the yew tree. "Help yourself," said the Vicar. "We're only too pleased to have them used." Several wheelbarrow loads up a slippery path to our van, a donation to the church funds and we were away with the goodies. Sorted, stacked and labelled, back at home the haul was stored in the former pigsties where we keep our carving wood. Somehow it's always nice to know where the wood for your carving came from rather than using an anonymous machined piece from a shop; and if you can carve directly from a log or branch, how much more choice of timber you will have. Using just a few basic woodcarving tools, this seashell weekend project introduces you to direct carving using a tree branch or log of wood. 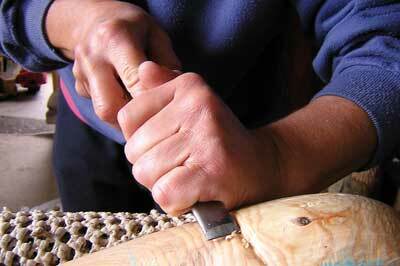 Other skills which will be examined are rounding, cutting hollows and making long flowing cuts. If you look closely at a real seashell, you will see there is a little curled channel that runs along the outside of the lower half of the aperture, and this makes a nice delicate finishing touch for your carving. The channel is deepest in the middle, at the bottom of the shell, becoming shallower at each end and finally merging into the outer surface of the shell above the widest part of the aperture. Mark the curving path of the channel and starting at the widest part of the aperture, cut a groove downwards and towards the bottom of the shell using the No.9 3/8in gouge with a mallet. Do not start above here because you will lift away a chip - if you want to extend the groove upwards you will have to cut in the opposite direction and towards the apex. Stop cutting at the bottom of the curve or you will cut against the grain. Repeat the cut from the opposite side of the aperture so that both grooves meet cleanly at the same depth. Then with the No.3 gouge, work towards the rounded end of the shell and carefully pare away the edge of the groove, merging it into the surface of the shell so the other side of the groove becomes the curled lip around the outer edge of the aperture. 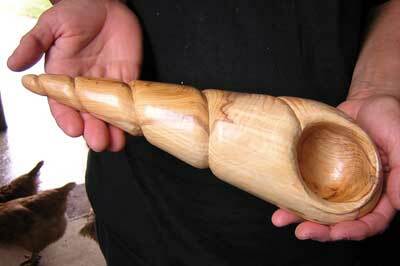 I used a straight branch of yew (Taxus baccata) about 305mm long with a diameter approximately 75mm, as round in circumference as possible along its length which I chose because yew has a darker heartwood than its sapwood, and thus the hollow aperture and the tip of the shell will contrast nicely with the outer lighter coloured sapwood. 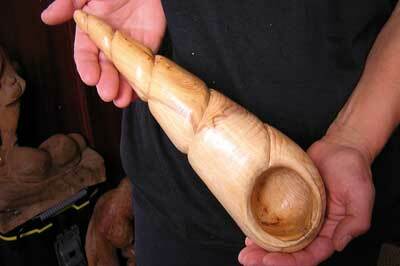 Other woods that can be used in the same way are laburnum, acacia (robinia) or plum. 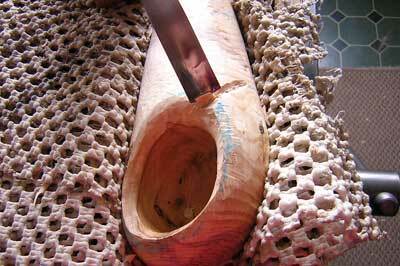 There is no need to remove the bark beforehand as it will be removed as you carve. 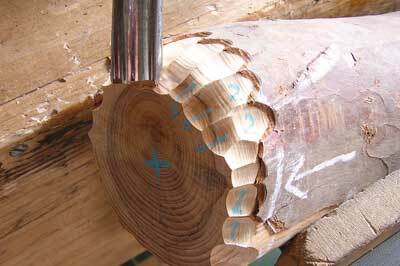 If you have to use a squared length of wood instead of a log, you will need to prepare it as cylindrical as possible, making sure there are no knots, deep indents or projections before you start carving. 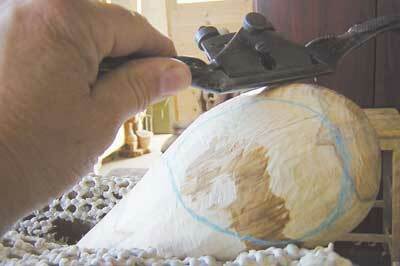 Rounding over the aperture end is an essential technique almost always used in carving in the round and is done by lifting your gouge hand as you cut from all round the circumference towards the highest or central area. With practice, doing this should become second nature to you. 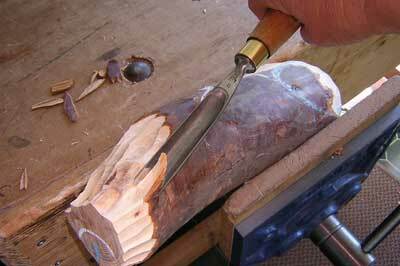 Using a mallet and deep gouge such as a No.8, 9, 10 or 11 3/4in, round over the end of the log, working towards the highest place on the end from all round, and remembering to lift your gouge hand as you cut forwards to produce a rounded over cut. Although it is possible to use a flatter gouge, the shaping will be done more quickly if you use a deeper one because each cut will be deeper. To start rounding the end, make sure the log is held securely in the vice so it cannot slip or move as you work, and make the first cut, gouge bevel down, at a fairly steep angle outwards and across the sawn edge of the log. Strike the end of the tool handle smartly with the mallet so the cutting edge 'bites' into the wood. 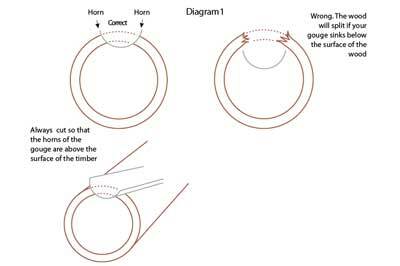 If the tool slips or scoots off the wood, hold the gouge a little more upright but not so steeply that its corners, or 'horns' dig in (see diagram 1). 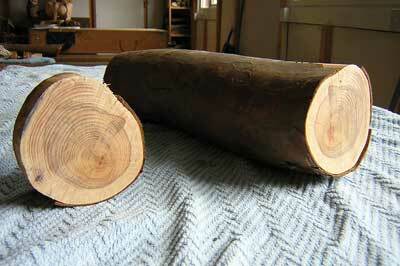 Aim towards the centre of the log and cut off the sharp edge around the circumference of the log. 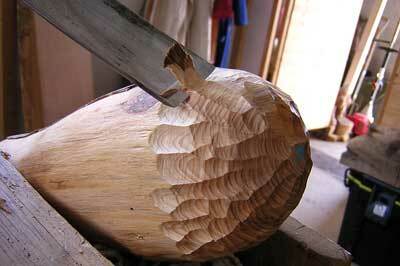 You should be cutting outwards, thus with the grain, as if you are sharpening a giant pencil. Having completed the initial cuts around the end of the log, place the cutting edge of the gouge a little further back from them in line with one of the ridges between them. 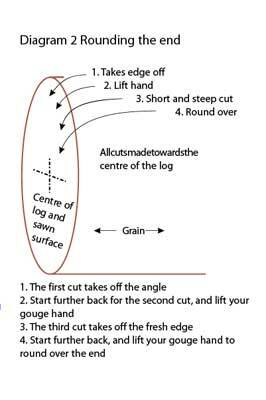 Steadily tap with the mallet along the ridge and remove it and as you approach the end of the log, lift your gouge hand so that the cut advances over the edge, so rounding the cut over and into the original flat sawn surface at the end of the log (see diagram 2). Continue thus around the circumference of the log, aiming towards the centre of the end and as you circumnavigate, gradually extend the length of your cuts until the original flat sawn surface is completely removed. 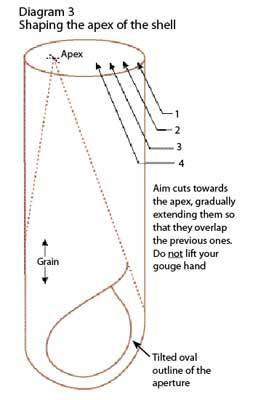 If you find the end is becoming more pointed than rounded, lift your gouge hand a little more as you cut over the edge (see diagram 2). by tilting it too much. If your No.3 gouge is not wide enough you could use a spokeshave, microplane or surform as an alternative way of smoothing the surface. 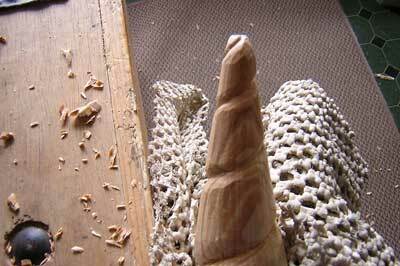 To shape the apex of the shell, imagine you are sharpening a pencil, i.e. 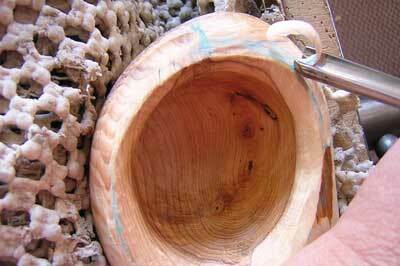 cutting outwards with long straight overlapping cuts towards the lead (tip) at the other end of the pencil (log). The tip or apex of a shell usually lies to the left of its aperture, so on the smoothed rounded end of your wood, draw the outline of the aperture, which should be egg shaped and slightly tilting to the right, (see diagram 3) and mark the position of the apex on the other end so that it is to the left as you look at the aperture. 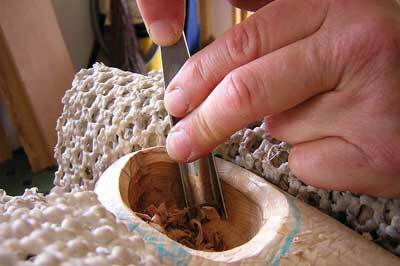 Then using the deep gouge and mallet, start with a short angled cut across the end around the circumference, aiming towards the tip of the shell with each cut. Continue the cuts starting further back from the end â€“ but do not lift your gouge hand as when rounding over the other end - so each cut overlaps the previous ones, extending them more on the right-hand side of the log as far back as the top of the aperture, making your shell taper and lean to the left when viewed from the aperture (see diagram 4). For now, leave a small flat area on the end at the apex which allows you to adjust the final position of the apex and helps with holding in the vice. Smooth off the whole surface as before, removing any remaining bark, and adjust the shape until your shell resembles a lopsided teardrop and feels comfortable and smooth when held. 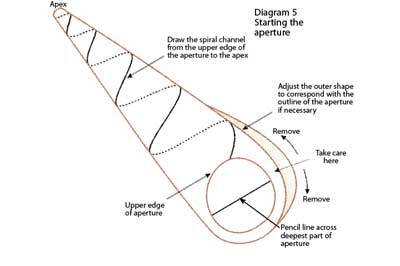 Using chalk or pencil, redraw the outline of the aperture on the newly smoothed area, and mark the spiral channel which runs from the upper edge of the aperture around the shell to the apex (see diagram 5). Carefully pare and adjust the rounded shape of the outer edge of the shell so that it corresponds with the curve of the lower part of the aperture using the spokeshave, surform or inverted wide No.3 gouge as described above. Hollows and concavities of various depths occur in all forms of carving, and these are carved by cutting in from one side of the hollow towards its centre, then from the opposite side so that the two cuts meet at the same depth and the chip lifts away cleanly. This is known as 'making opposing cuts', and the technique is used for both making the hollowed aperture and cutting the spiral channel from the top of the aperture to the tip of the shell. Within the outline of the aperture, draw a line across marking the deepest part of the hollow. 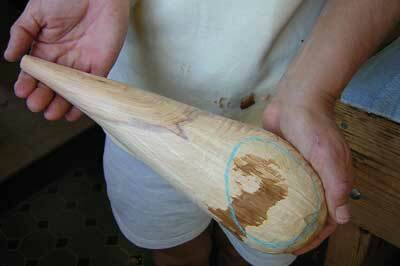 Then using a mallet and a No.5 1/2in gouge, make a series of opposing cuts towards the line, extending and deepening them until you produce a hollow (see diagram 6). If a chip remains attached, resist pulling it away, but cut towards it more deeply from the attached side to release it cleanly. The hollow can now be deepened by hand pressure, raising your gouge hand more, tilting and scooping towards the centre of the aperture from each side. When the edges of the aperture begin to obstruct, round them over (see diagram 7) to allow easier access. As you near the final depth use lighter shallower cuts and smooth the hollow, especially where the opposing cuts meet at the bottom. Then adjust the internal shape so that it corresponds with the external shape of the shell with the walls as uniform as possible. Using your fingers and thumb as callipers, feel the walls for discrepancies, mark them with chalk or pencil and carefully pare them away. It can be helpful to use a deeper gouge, such as a No.9 3/8in, and work by hand to smooth the inside surface of the aperture, but take care not to lever too hard against the walls or they may break. 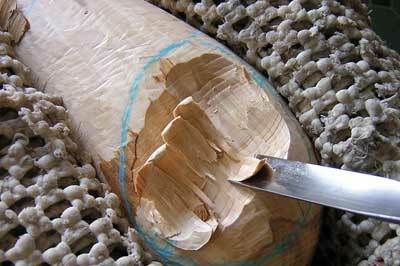 A gooseneck scraper can also be used to smooth the concave surface. 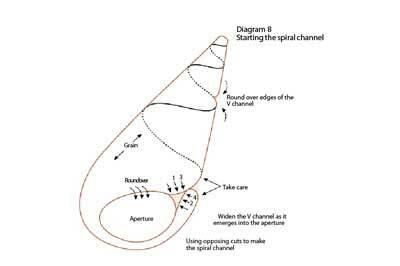 When you are happy that the concavity is smooth and the walls uniform, it is time to begin carving the spiral channel from the aperture to the apex of the seashell. If you have not yet done so, round over the upper edge of the aperture to the start of the spiral channel using the 1/2in or 3/4in No.3 gouge, not forgetting to lift your hand as you cut towards the hollow. 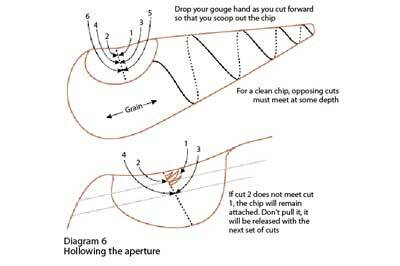 With the same gouge, begin cutting the spiral channel using opposing cuts, holding the tool fairly steeply, and starting at the upper edge of the aperture (see diagram 8). Cut for about 50mm along its pathway from each side, taking care not to lift, twist, or flick out the chip, withdrawing the tool at the same angle at which it entered to produce a cleanly cut V channel. Round over both upper and lower sharp edges of the V you have just cut, widening it a little at the start where it emerges from the aperture so that the outside surface of the shell merges smoothly into the channel - this can be done by inverting the gouge bevel uppermost, and paring with a slicing action along the sharp edge as long as you cut with the grain - usually towards the tip along the lower edge and towards the aperture on the upper edge. Continue thus with the spiral channel, cutting and rounding its edges as you advance towards the tip or apex. Work small sections at a time so that you can alter the angle of the spiral channel if needed. If your shell becomes more upright and leans less to the left when viewed from the aperture, it can be corrected by removing a little of the surface above and to the left of the spiral channel before you continue onwards. 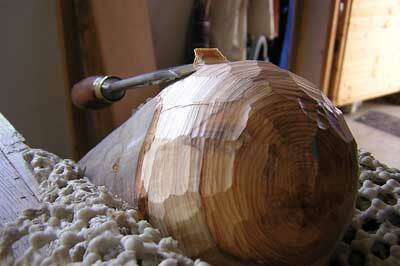 If you want a more bulbous shell, cut the channel deeper and wider before rounding its edges. 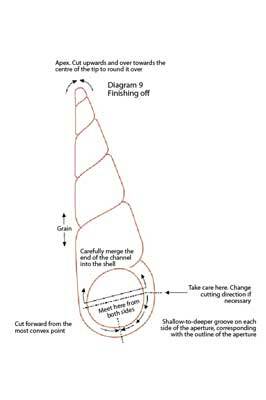 When the spiral channel emerges on the small flat area you left at the tip, use the No.3 gouge inverted and carefully pare away its sharp edges using as little pressure as possible. Cut towards the centre of the apex from all round until it is bluntly pointed (see photo 12) and if having done this, it looks a little top heavy, reduce the circumference of the previous section. 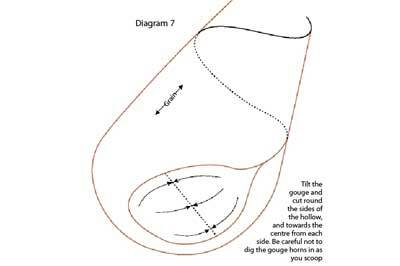 Mark the curving path of the channel and starting at the widest part of the aperture, cut a groove downwards and towards the bottom of the shell using the No.9 3/8in gouge with a mallet (see diagram 9). Do not start above here because you will lift away a chip â€“ if you want to extend the groove upwards you will have to cut in the opposite direction and towards the apex. 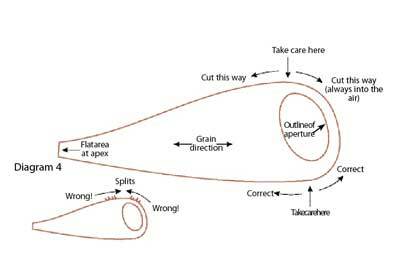 Stop cutting at the bottom of the curve or you will cut against the grain. Repeat the cut from the opposite side of the aperture so that both grooves meet cleanly at the same depth. Then with the No.3 gouge, work towards the rounded end of the shell and carefully pare away the edge of the groove, merging it into the surface of the shell so the other side of the groove becomes the curled lip around the outer edge of the aperture. Handle the shell between your hands and feel for any irregularities, nicks or roughness, and remove these by careful paring with a No.3 gouge. Then use a sharp cabinet scraper to smooth it. Check that inside surfaces are smooth and that the spiral channel is cleanly cut along its length. Then abrade all surfaces using 240grit garnet paper. Finally, apply a coat of wax polish. If this reveals any blemishes, remove them. For a very smooth finish, re-abrade all surfaces with 320grit garnet paper, re-polish with a good quality wax polish and buff up with a lint-free duster. Your carving is complete. For details of courses with Zoe Gertner, visit her website.